Fed Hikes Rates in December, More Coming? Home Blog Fed Hikes Rates in December, More Coming? On December 14, 2016, the US Federal Reserve met and decided to raise interest rates 25 basis points. 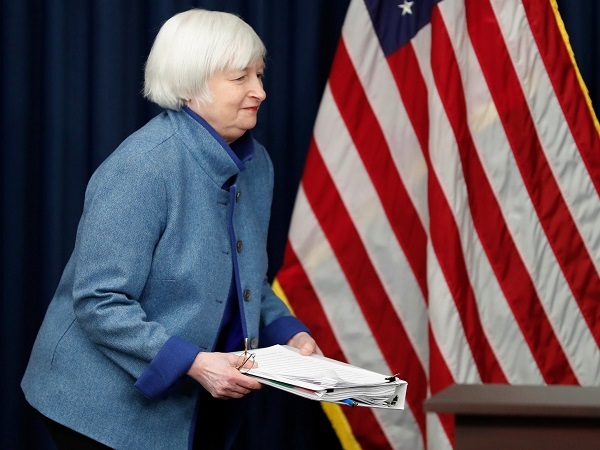 The target overnight Fed Funds rate was raised from 0.25%-0.50% to 0.50% to 0.75%. In the Federal Open Market Committee (FOMC) statement, they said, “The Committee expects that, with gradual adjustments in the stance of monetary policy, economic activity will expand at a moderate pace and labor market conditions will strengthen somewhat further. Inflation is expected to rise to 2 percent over the medium term as the transitory effects of past declines in energy and import prices dissipate and the labor market strengthens further. Near-term risks to the economic outlook appear roughly balanced.” This move was well anticipated by the markets. However along with the statement, the committee released their projections for rate hikes in 2017. For the markets, this was a surprise as the Fed added 1 more rate hike, for a total of three in 2017, to their projected total. The central bank made no mention of any coming fiscal policy changes by the new Trump administration. Immediately after the announcement, US stocks fell, short term US yields went up, and the US dollar rallied. For business, this means the cost of borrowing money will continue to rise in 2017. The markets will now price in three rate hikes over the next 12 months. Given the recent spike in long term U.S. Treasury bond yields, the bond issuance may see weakened demand until more certainty can be attained over the direction of both short-term and long-term interest rates. Over 2016, the central bank has indicated a willingness to allow inflation and wages to accelerate prior to acting to tighten monetary conditions. Both are now moving higher. As mentioned in the previous article “Fed Decides, Market Reacts”, the Federal Reserve (Fed) has three key components. They have the dual mandate of employment and price stability. However, they also have a regulator role of financial stability. In practical terms, this means they have oversight on the country’s largest banks. In more theoretical terms, this means they must monitor the stock, bond and currency markets for volatility and potential risk bubbles forming. This latter responsibility has been complicated by keeping interest rates low for an extended period. This fall, Fed members began warning of this risk and mentioning it in their speeches. Therefore, the biggest risk for business is that the Fed has delayed raising interest rates for too long and therefore feels the need to catch up with more interest rate increases than the market is expecting in 2017. Coupled with a more aggressive interest rate policy, a strong U.S. dollar rally would likely accompany the Fed interest rates moves and hurt exports for U.S. businesses. Why did the Fed act? Actually, the first question to be answered is why didn’t they raise rates in September or November? The answer, of course, is the 2016 U.S. presidential election. The Fed wanted to stay as far away as possible from appearing to have any influence over the outcome. Historically, the Fed delays interest rate decisions until after the outcome is known. Yet even by delaying, the Fed came under scrutiny during the campaign and was brought up during the presidential debates. Tough job! Since December of last year, the Fed has not raise interest rates. If we look at U.S. GDP, we can understand the central bank’s reluctance to move as the first half of 2016 was very weak. 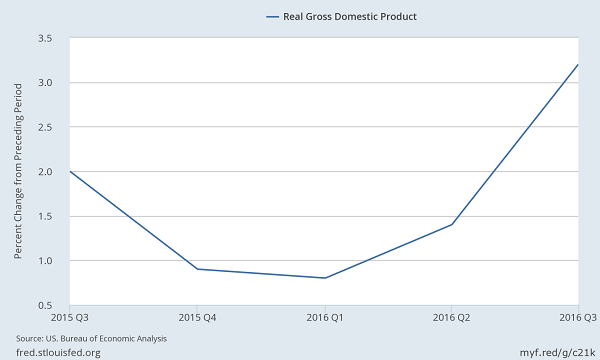 The graph below shows a two-year quarterly graph of U.S. GDP. It decelerated from Q3 2015 until Q2 2016. In Q3 2016, it finally broke above 2.0percent, rising to 3.2percent. For Q4 2016 GDP, the Atlanta Federal Reserve model (GDPNow) is estimating 2.4percent and the New York Federal Reserve model (Nowcasting) is estimating 2.7percent. The point is that GDP is at a level where the Fed can comfortably raise interest rates without concern the economy will be adversely impacted. 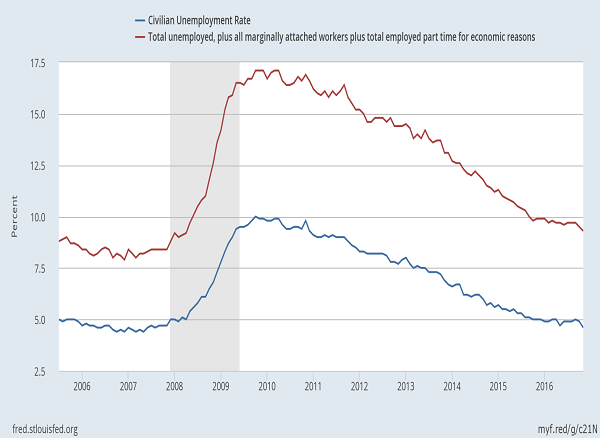 For U.S. unemployment, the chart below shows both the civilian unemployment rate (blue, U-3) and the total unemployed plus marginally attached workers (red, U-6). The good news is that both the U-3 and U-6 have come down significantly from the 2008 recession (shaded area). The November U-3 was 4.6percent and the U-6 was 9.3percent. While the U-6 remains elevated compared to before the recession (8.4percent), the U-3 is below (4.7percent). This is another signal for the Fed to begin to normalize interest rates. Regarding inflation, we can see it begin to show an upward trend. The chart below shows U.S. consumer price index (CPI) for all items and U.S. CPI less food and energy (volatile items taken out). 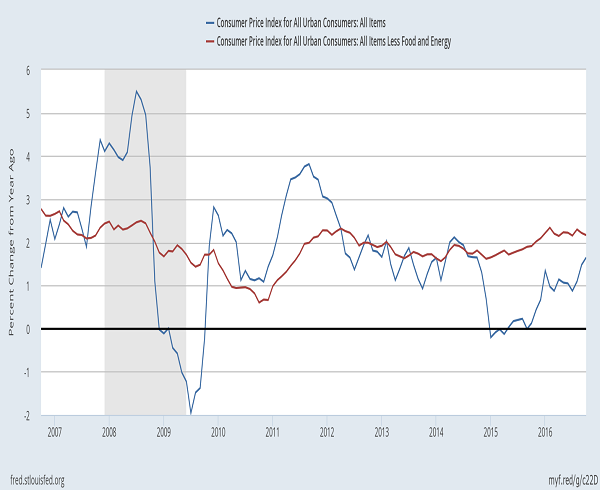 The headline CPI has been going sideways at 2.3percent since February of 2016, but the CPI less food and energy has been moving up rapidly from a low of zero in September of 2015 to the recent high of 1.65percent in October of 2016. The deflation risk has clearly abated and now the Fed can turn to worrying about rising inflation. The Fed’s target is to have inflation average 2.0percent. Again for raising interest rates, this is a weaker signal to begin raising rates, but shows the trend toward higher inflation. Wrapping up these indicators, GDP, unemployment and CPI are mainly all pointing in the same direction and provide the Fed reasons to raise interest rates. What would hold the Fed back? Simply, a strong U.S. dollar rally. When the Fed announced the start of the tapering from quantitative easing in December of 2013, this began a 20percent U.S. dollar rally. The chart below shows the U.S. Dollar index moving from 80 to 100 over 2014. It has remained in a range of 92-100 since that time, but now appears to be making new highs. A rapid ascent in the currency acts as another monetary tightening similar to a rate hike. As an example, S&P 500 companies derive 48percent of their revenues from foreign sources. Therefore, these companies will see a decline in revenues when the U.S. dollar rallies if they are not completely hedged. Given the European Central Bank, the Bank of England and the Bank of Japan are all in monetary easing mode, the Fed needs to be cautious about raising rates as the U.S. dollar will appreciate in this environment. The Fed raised rates and will likely raise rates again in 2017. The U.S. economy is performing well and will likely adjust to higher rates. The U.S. dollar remains a key factor to how many interest rates occur in 2017.